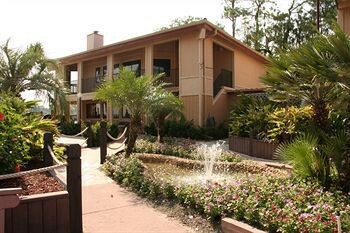 Property Location With a stay at Bryan&apos;s Spanish Cove in Orlando (Downtown Disney® area/Lake Buena Vista), you&apos;ll be convenient to Lake Bryan and Downtown Disney® area. This condo is within close proximity of Lake Buena Vista Factory Stores and DisneyQuest®.Rooms Treat yourself to a stay in one of the 44 guestrooms, featuring fireplaces. Private kitchens make it easy to prepare your meals. Cable programming and DVD players are provided for your entertainment, while wireless Internet access (surcharge) keeps you connected. Conveniences include safes and coffee/tea makers.Rec, Spa, Premium Amenities Take advantage of recreation opportunities including an outdoor pool and a spa tub. Additional amenities include wireless Internet access (surcharge), tour/ticket assistance, and a picnic area.